Keywords: Chronic Kidney Disease. Age. Gender. Marital Status. Education. Occupation. Depression is an extremely common illness affecting people of all ages, genders, socioeconomic groups, and religions in India and all over the world. According to global estimates, 322 million people suffered from depressive illness in 2015. A remarkable disease burden at national and global levels is due to depression. In India, the Disability Adjusted Life Years (DALYs) as a consequence of depression are estimated to rise by approximately 2.6 million (22.5%) due to population growth and ageing by 2025. At the individual and family level, depression and anxiety cause a negative interpersonal, social, and economic impact leading to overall poor quality of life (QOL). Chronic kidney disease (CKD) leads to a progressive loss in kidney functions over a period of months to years. CKD is a highly disabling chronic disease that has a severe impact on patient’s lives. CKD affects nearly ten per cent of the population worldwide, and lack of access to affordable treatment leads to millions of death each year. In 1990, CKD was ranked 27th in the list of causes of total number of deaths worldwide; but, by 2010, it rose to 18th position, according to the 2010 Global Burden of Disease study. This degree of movement up the list was second only to that following human immunodeficiency virus (HIV) and acquired immunodeficiency syndrome (AIDS). More than two millions of the population worldwide currently receive treatment with dialysis or a kidney transplant to stay alive; yet, this number only represents ten per cent of people who actually need treatment to live. Cukor et al. examined the prevalence of a broad range of psychopathology in an urban HD centre and their impact on QOL. They reported that 70% were found to have a psychiatric diagnosis. Twenty nine per cent had a current depressive disorder: 20% had major depression and nine per cent had a diagnosis of dysthymia or depression not otherwise specified. Twenty seven per cent had a current major anxiety disorder. A current substance abuse diagnosis was found in 19% and ten per cent had a psychotic disorder. Cengić and Resić studied 200 patients from a clinic for HD in Sarajevo, Bosnia and Herzegovina. They reported that gender and marital status did not have a significant influence on occurrence of depression in these patients. They found that along with age, level of depression increased too and that being educated and employed significantly decreased the risk for occurrence of depression. Theofilou reported that female patients had higher trait anxiety scores, and those patients with less education showed higher scores in the General Health Questionnaire-28 (GHQ-28) subscales of anxiety/insomnia. In CKD, depression could conceivably affect medical outcomes in patients through at least four different mechanisms. Depression can alter access to or use of healthcare, impact nutritional status, effect compliance with dialysis and medication regimens, or alter the immunologic and stress responses of patients. Anxiety in patients undergoing HD may lead to poor adherence to treatment regimen. Sometimes it can lead to disruptive behaviours in these patients in clinic or dialysis centres, leading to frustration among patients and their caregivers. Aptly designed epidemiological research studies with data using strict psychiatric diagnostic criteria in patients undergoing HD with CKD that can render accurate results on this topic is very meager. This study aims to assess depression and anxiety in these patients, and also study the sociodemographic variables associated with them. The general consensus regarding therapy for depressive symptoms in patients with end-stage renal disease (ESRD) may still be inconclusive; yet, it is reasonable to believe that treatment of patients with high levels of depressive affect will result in improved outcomes. The study was conducted in the Department of Nephrology and Department of Psychiatry at Narayana Medical College & Hospital (NMCH), Nellore, Andhra Pradesh, India. It is a hospital-based cross-sectional study. The ethics review committee of this institution approved this study. Data was collected over a period of three months from January to March in the year 2018. The sample of subjects were obtained from those attending the outpatient clinic or admitted to the inpatient unit of the Department of Nephrology at NMCH who were suffering from CKD and undergoing HD. Patients who met the inclusion criteria were administered a clinical interview and the tenth revision of the International Statistical Classification of Diseases and Related Health Problems (ICD-10) criteria was used to diagnose depression and anxiety. The Hamilton rating scale for depression (HAM-D) and the Hamilton rating scale for anxiety (HAM-A) were used to assess the severity of depression and anxiety respectively. • Patients diagnosed with CKD and were receiving HD. • Age between 18-65 years. • Ability to answer the provided questionnaire. • Patients with history of comorbid substance abuse. • Patients with history of known prior psychiatric diagnosis. • Patients who did not give consent to participate in the study. HAM-D is a 21-item clinician-administered multiple-choice measure of depression symptom severity. It is the most commonly used rating scale that assesses the range of symptoms that are most frequently observed in patients with major depression. The first 17 of the 21 items contribute to the total score and items 18-21 give additional information not part of the scale, such as paranoia, depersonalization and derealization, obsessional and compulsive symptoms, and diurnal variation. Symptoms are defined by anchor point descriptions (ranging from three to five possible responses), which increase in severity. It generally takes 15-20 minutes to complete the interview and score the results. A score of equal to or less than seven is widely thought to indicate remission on HAM-D. A limitation of HAM-D is that atypical symptoms of depression (e.g. hypersomnia, hyperphagia) are not assessed. HAM-A is one of the first rating scales developed to measure the severity of anxiety symptoms, and is widely used, well-validated tool in both clinical and research settings. There are 14 items in the scale. Each item has a set of symptoms and they measure psychic anxiety and also somatic anxiety. Each item is scored on a scale of zero (not present) to four (severe), with a total score range of zero to 56, where 14-17 indicates mild severity, 18-24 moderate severity, and 25-30 severe anxiety. The HAM-A takes 15-20 minutes to complete the interview and score the results. It has been criticised for its apparent inaccuracy in discriminating between anxiolytic or antidepressant effects, and between somatic anxiety compared to side-effects; thus, of limited usage in the evaluation of anxiolytics. Patients were first screened from the outpatient department and those admitted in the inpatient facilities of nephrology department, NMCH to satisfy the inclusion and exclusion criteria. All participants fulfilling the selection criteria were approached and explained about the purpose of the study. Written consent was taken from all the selected respondents. Confidentiality and anonymity was ensured for all the participants. 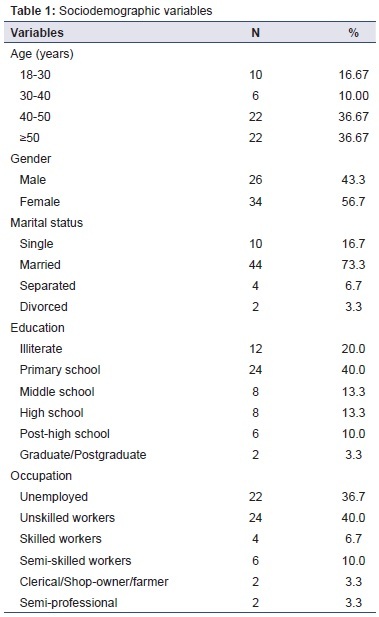 The sociodemographic profile of all the subjects was obtained. A clinical interview using ICD-10 was used to diagnose depression and anxiety. Subjects were then administered with HAM-A and HAM-D rating scales and the results were recorded. The interview was ended by giving a feedback to the patient. Chi-square test was used for testing the association between variables. Statistical significance was assigned to all the p-values <0.05. Statistical Package for the Social Sciences (SPSS) Version 20.0 was used to analyse data. The total number of participants recruited for the study was 60. The mean age of the sample was 44.17 years with standard deviation (SD) 11.24. Majority of the participants in the study were adult females (34 [56.7%]). 73.3% of the participants were married. Majority, i.e. 24 (40%) of the participants in the study had studied up to primary school. Most of the study participants (40%) were occupied as unskilled workers (Table 1). Eighteen (30%) patients of CKD and undergoing HD were suffering from depression. 13.3% of the patients suffered from mild and moderate depression and 3.3% of them from severe depression. Forty two (70%) patients did not suffer from depressive disorders (Table 2). Twenty (33.3%) patients of CKD and undergoing HD were suffering from anxiety. 16.7% of the patients suffered from mild anxiety, 13.3 % from moderate anxiety, and 3.3% of them from severe anxiety. Forty (66.7%) patients did not suffer from anxiety disorders (Table 2). There was significant association between marital status, education, and occupation with HAM-D scoring; age and gender had no significance in relation with HAM-D scoring (Table 3). There was significant association between age, marital status, education, and occupation with HAM-A scoring; gender had no significance in relation with HAM-A scoring (Table 4). Depression was seen in 30% of our patients suffering from chronic renal disease and undergoing HD, with varying degrees of severity. Similar ranges of depressive symptoms have been seen in previous studies conducted among patients in this population subset. Kimmel and Levy reported that 25% of HD patients suffer from depression, Hedayati et al. reported 26.7%, Son et al. 25.34%, and Drayer et al. 28%. However, in a study done by Cengić and Resić in 200 patients from clinic for HD in Sarajevo, Bosnia & Herzegovina, nearly 51% of patients showed depression (Beck’s Depression Inventory [BDI]>11) in various degrees (30% mild depression, 8.5% moderate depression, and 12.5% severe depression). It could be related to the lower cutoff score used for assessing depression in this particular study. Anxiety disorders were seen in 33.3% of our patients undergoing HD with varying severity. A similar study was conducted by Taskapan et al. at a University hospital haemodialysis unit in Turkey. The study population included 40 chronic renal failure patients. HAM-A was used and found that 30% of the patients suffered from anxiety disorder. Most of our patients suffered from mild and moderate depression and anxiety respectively; two of them suffered from severe depression and anxiety. Age, gender, and marital status did not have a significant influence on appearance of depression, though age did have a significant influence on anxiety. Gender and marital status did not have a significant influence on anxiety. Similar results have been found in other studies in relation to gender, marital status, and depression. [10,21] We expected being married to have a more positive influence, i.e. comparatively less depression on account of the emotional support the institution of marriage offers, which was not the observation in our study. It could be explained perhaps by the additional responsibilities and obligations marriage entails on the individuals. In our study, age did not have a significant influence on appearance of depression as was also seen in previous study by Lopes et al. ; but, in contrast to the findings by Drayer et al. which found increasing age levels to be found with increasing number of patients suffering from depression. When educational status was analysed with depression and anxiety, we found that the population subset with better education had significantly lower levels of depression and anxiety. This can be understood by the fact that being better educated helps them understand more about their illness, its consequences, importance of adherence to treatment protocols like dialysis, dietary regimen, and medications, which in turn improves their physical and mental health resulting in lesser psychological symptoms like depression and anxiety. Furthermore, on analysis between employment status and anxiety and depression, we found being employed conferred a significantly lower levels of depression and anxiety. This is in concurrence with most of the other previous studies done in this population. [10,21] This can be attributed to the fact that better employment means better financial stability, better access to healthcare, and hence, lesser psychological symptoms related to depression and anxiety. In fact, Yucedal et al. found in their study that the main reasons for anxiety and depression in patients with ESRD undergoing HD was being unemployed and loss of libido. 2. The patients were not prospectively followed and hence, features like outcome, mortality, and prognosis could not be studied. 3. Duration and severity of CKD were not considered. 1. Our study found significant depressive and anxiety symptoms in CKD patients undergoing HD. 2. Married patients, patients with higher educational status, and employed patients had significantly lesser depressive and anxiety symptoms than unmarried patients, patients with lower educational status, and unemployed patients. Patients with CKD and undergoing HD should be screened regularly to identify the presence of anxiety and depressive symptoms, and prompt referral and treatment must be initiated if found. Charlson FJ, Baxter AJ, Cheng HG, Shidhaye R, Whiteford HA. The burden of mental, neurological, and substance use disorders in China and India: a systematic analysis of community representative epidemiological studies. Lancet. 2016;388(10042):376-389. Jha V, Garcia-Garcia G, Iseki K, Li Z, Naicker S, Plattner B, et al. Chronic kidney disease: global dimension and perspectives. Lancet. 2013;382(9888):260-72. Couser WG, Remuzzi G, Mendis S, Tonelli M. The contribution of chronic kidney disease to the global burden of major noncommunicable diseases. Kidney Int. 2011;80:1258-70. Kimmel PL, Peterson RA. Depression in end-stage renal disease patients treated with hemodialysis: tools, correlates, outcomes, and needs. Semin Dial. 2005;18:91-7. Kimmel PL. Psychosocial factors in dialysis patients. Kidney Int. 2001;59:1599-613. Kimmel PL. Depression in patients with chronic renal disease: what we know and what we need to know. J Psychosom Res. 2002;53:951-6. Cukor D, Coplan J, Brown C, Friedman S, Cromwell-Smith A, Peterson RA, et al. Depression and anxiety in urban hemodialysis patients. Clin J Am Soc Nephrol. 2007;2:484-90. Cengić B, Resić H. Depression in hemodialysis patients. Bosn J Basic Med Sci. 2010;10 Suppl 1:S73-8. Kimmel PL, Peterson RA. Depression in patients with end-stage renal disease treated with dialysis: has the time to treat arrived? Clin J Am Soc Nephrol. 2006;1:349-52. Gonzalez JS, Shreck E, Batchelder A. Hamilton Rating Scale for Depression (HAM-D). In: Gellman MD, Turner JR, editors. Encyclopedia of behavioral medicine. New York, NY: Springer; 2013:887-8. Hamilton M. The assessment of anxiety states by rating. Br J Med Psychol. 1959;32:50-5. Kimmel PL, Levy NB. Psychology and rehabilitation. In: Daugirdas JT, Blake PG, Ing TS, editors. Handbook of dialysis. 3rd ed. Philadelphia: Lippincott Williams and Wilkins; 2001:413-9. Hedayati SS, Bosworth HB, Briley LP, Sloane RJ, Pieper CF, Kimmel PL, et al. Death or hospitalization of patients on chronic hemodialysis is associated with a physician-based diagnosis of depression. Kidney Int. 2008;74:930-6. Son YJ, Choi KS, Park YR, Bae JS, Lee JB. Depression, symptoms and the quality of life in patients on hemodialysis for end-stage renal disease. Am J Nephrol. 2009;29:36-42. Drayer RA, Piraino B, Reynolds CF 3rd, Houck PR, Mazumdar S, Bernardini J, et al. Characteristics of depression in hemodialysis patients: symptoms, quality of life and mortality risk. Gen Hosp Psychiatry. 2006;28:306-12. Taskapan H, Ates F, Kaya B, Emul M, Kaya M, Taskapan C, et al. Psychiatric disorders and large interdialytic weight gain in patients on chronic haemodialysis. Nephrology (Carlton). 2005;10:15-20. Yucedal C, Olmez N, Gezen G, Celik F, Altindag A, Yilmaz ME, et al. Depression in dialysis patients. EDTNA ERCA J. 2003;29:151-5. Lopes AA, Albert JM, Young EW, Satayathum S, Pisoni RL, Andreucci VE, et al. Screening for depression in hemodialysis patients: associations with diagnosis, treatment, and outcomes in the DOPPS. Kidney Int. 2004;66:2047-53. Pindikura RK, Gunturu AG, Kadiveti UK. Depression, anxiety, and their association with sociodemographic factors in patients undergoing haemodialysis: a cross-sectional study. Open J Psychiatry Allied Sci. 2019;10:44-8. doi: 10.5958/2394-2061.2019.00011.9. Epub 2018 Nov 10.